The term jig is applied to a device designed to hold work while being machined, and to contain guides to govern the cutting tools. Jigs are divided into many classes, such as grinding, boring, turning, planing, milling, and drilling jigs. Extremely accurate work cannot be obtained in jigs for drilling because there must be a difference between the diameters of the bushing hole and the drill to be used, and this difference can be transferred to the work. In a, Fig. 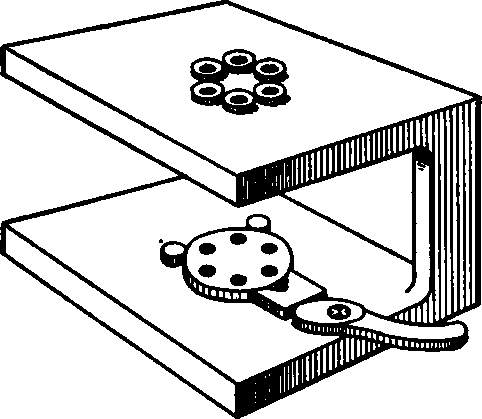 53, is shown a drilling jig in its simplest form. The aim of the designer should be to design the jigs as nearly foolproof as possible, for in the use of jigs there must be locating points to position the work and locking devices for holding the work in position. Should a jig be made where the successful duplication of work is left partly dependent upon the care of an unskilled operator, there is the possibility of many ruined pieces, due to the operator's failure through lack of interest to properly clean the locating points, to remove chips from corners, or to properly secure the work in the jig. 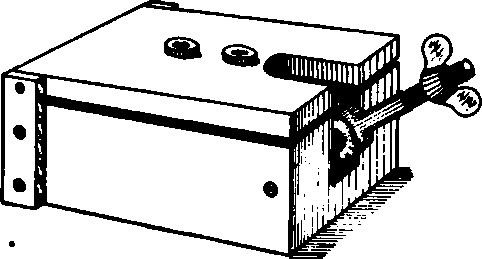 Therefore, all jigs should be designed in such a manner that the personal element is reduced to the minimum. Fig. 53. Simple Farm of Drilling Jig. The feature of the simple design of jig in Fig. 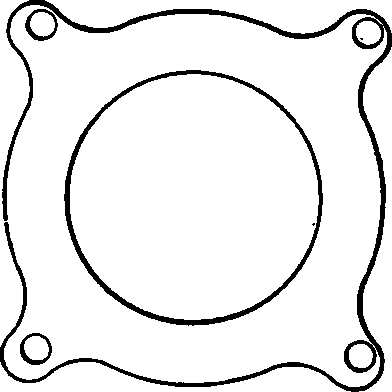 54 is the V-shaped portion for centrally locating a round piece of work. When a lubricant is used in the machining operation the chips stick to the angular sides, but to reduce this danger to the minimum, the V is relieved, as at a, Fig. 54. In Fig. 55 we have the same V feature but of improved design intended to mechanically locate and hold. 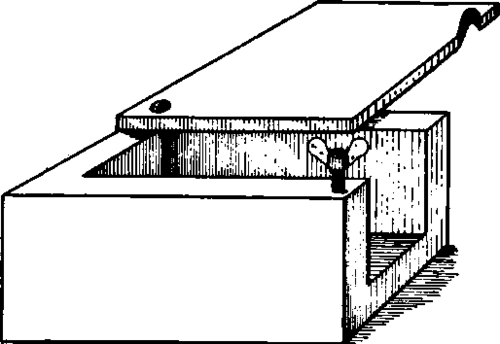 It is noted that there are no locking screws, cams, or adjusting screws for the operator to forget, and that all that is necessary is for the operator to insert the piece of work and to close the cover. This, in its simplest form, is what is known as foolproof, and the designer must design the tool at hand to operate mechanically as nearly as possible. Another element which enters into the design of a jig and which calls for ingenuity on the designer's part, is the initial locating of a casting that is to be drilled, milled, or otherwise machined. Castings vary greatly, and the design of locator shown in Fig. 56, and termed a spring pump, is excellently adapted to centrally locate pieces of work that vary. In Fig. 57, at a, is shown the end view of a carbureter body in the rough casting, while b shows the holes drilled, using the jig in Fig. 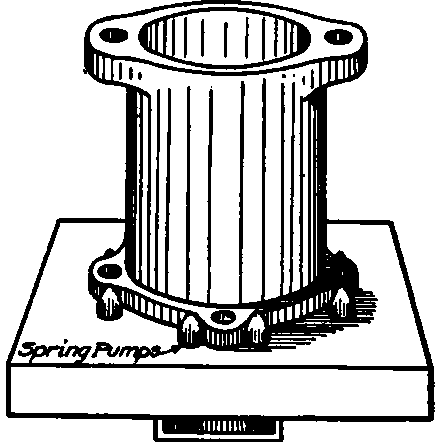 58, which embodies the spring-pump locators of Fig. 56. It is obvious that burrs, unequal shrinkage, and other foundry causes, may produce such variation in castings that a positive nest, as in Fig. 59, is out of the question. In other words, if the nest were made to accommodate or fit the largest variation in the castings, there would be such a loose fit on a smaller casting that it could turn in the nest and would look like Fig. 60 after the holes were drilled. Fig. 55. Drilling Jig with V-Rest and Clamping Device. Here is where the designer must be sure that the tools are designed in such a manner that the sequence of operations to complete the piece of work is such that the proper operation comes first. For an example, assume that the large hole in the carbureter body was drilled and bored in the first operation and then the holes in the four lugs were drilled while the carbureter body was positioned by the large hole and by the outside edge of one or more lugs. Then the castings would look as in Fig. 60, due to the variation in castings. While, on the other hand, if the tools are designed so that the first-operation jig is one for drilling the four holes in the lugs, and the body is located by the four lugs, then the second-operation jig, for boring the large hole, has 4 pins to enter the 4 holes in the lugs, and if the large cored hole is not central with the 4 holes before drilling, it will be so after boring the large hole, and the 4 holes in the lugs will be central with the outside lugs. The designer must not lose sight of this point, for his success depends largely upon his ability to design tools to do the proper operation first and in using the same holes for locating points, if possible, throughout the successive operations necessary to complete the work. Fig. 57. Carbureter Casting Rough and Finished by Use of Drill Jig. (2) Rounded ends of stop or of locating points, to prevent chips gathering. (3) Absence of corners where chips can gather. (4) Small feet on the bottom of the jig, instead of a broad bearing surface, because chips on the table of a drill press do no harm if 3 or 4 small feet are employed. (5) Remember that the quantity of parts to be produced should govern the elaborateness of the jig. Figs. 61 to 70 show designs of jigs that the student should become acquainted with thoroughly, as the locking devices and methods of holding the work are applicable to boring, milling, and grinding fixtures, where speed of operation is the prime factor. The jig in Fig. 61 is of the box type in which the work is held by clamping down the cover of the jig; this type is not intended for accurate work. Fig. 62 shows a similar clamping method, but a swinging cover. Fig. 58. Carbureter Body Held in Position by Spring Pumps. Fig. 60. 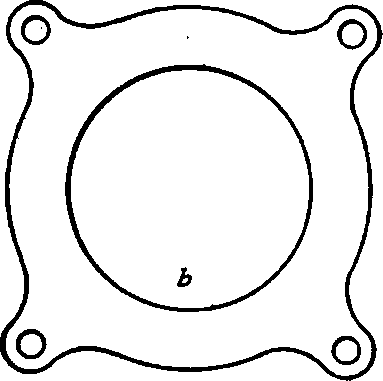 Nest for Carbureter Blank. Fig. 60. Possible Inequalities in Drilling Casting Shown in Fig. 67. Fig. 63 shows the screw-bushing type. The bushing not only holds the work, but it also acts as a guide for the drill. This type of jig does not produce accurate work, as the free fit of threads on the screw bushing permits it to tilt slightly, changing the center location of the hole in the work. Fig. 64 shows a simple type of jig designed for a multi-spindle drill press. Clamping devices are not as essential on jigs when a multi-spindle press is used, due to the fact that all drills are cutting at the same time, which prevents the work from shifting. Drilling-and-Reaming Jig. Fig. 65 can be elaborated upon, but the essential point is in being able to drill and ream in the same jig without removing the drill bushing. In operation the work is drilled by the bushings, then the jig is reversed and a reamer or a counterbore further machines the work. A bushing is used for the counterbore, but for a reamer a clearance hole or a soft bushing should be used, as a reamer is rendered useless after it has been reduced 0.001 inch in diameter and wears away quickly while revolving in a hardened bushing. Fig. 61. Hinged-Cover Box-Drill Jig. Fig. 62. Box-Drill Jig with Swinging Cover. Fig. 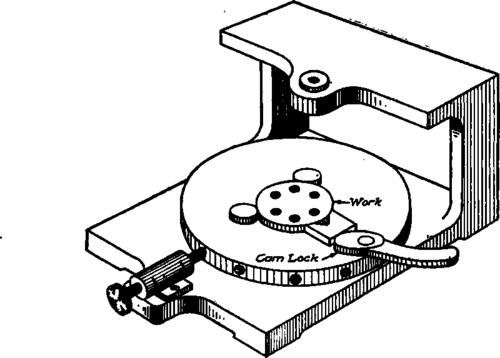 66 shows an Indexing type of jig. The object in using the indexing plate is, that when a number of holes are to be drilled in a circle it is a more accurate method than if the jig were made as in Fig. 67. Assuming that the work to be drilled is the plate in Fig. 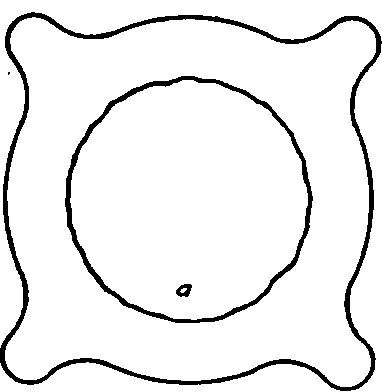 68, only 1 inch in diameter, then, by making the index plate in Fig. 66, say, 6 inches diameter, and by very accurately locating the index notches in its edge, we could allow slight discrepancies in the notches, for when the variations are reduced to 1:6 they are negligible. A better understanding of this point can be had by noting the difference in travel of the rim of a wagon wheel and the hub. 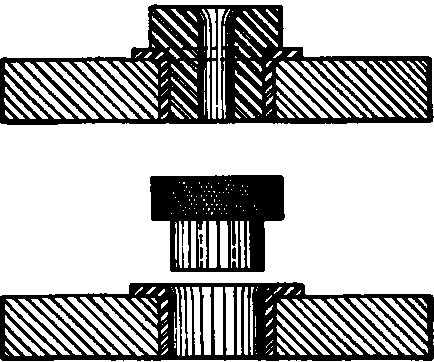 The student must bear in mind that the designing of jigs must not be confined to the crude designs shown herewith, but he must become familiar with the principles involved, such as locking devices, methods of locating, etc., and when designing a jig it is often best to embody several principles in a single jig in order to obtain the greatest efficiency. 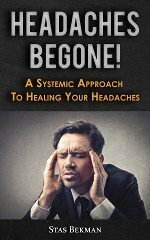 This idea is illustrated by slip bushings which are often used advantageously where a reaming, counterboring, or tapping operation is desirable without removing the work from the jig. Fig. 69 shows a plate which embodies the slip-bushing design, the lower view showing the bushing withdrawn. Fig. 53. Drill Jit with Screw Bushing. Fig. 64. Box Jig Designed for Multi-Spindle Drill press. Fig. 65. Drilling and Reaming Jig. Fig. 70 shows the most accurate design of jig. It is noted that the jig is attached to the faceplate of a bench lathe and that the jig containing the work is indexed, employing a master plate that has been accurately made and adopted as the shop master. The design shown in Fig. 70 is in its simplest form, and the designer must exercise his ingenuity in adapting the principle involved to the design of the jig desired. As each hole is spotted and drilled, the hole is made perfectly round and directly opposite the hole in the master plate by boring. Boring and Milling Jigs. Boring, milling, and other jigs are designed practically the same as drilling jigs, except that they are usually attached to a machine and the holding device, usually a screw clamp, is made more rigid while the machining is being done. Fig. 07. Simple Method of Holding Circular Piece for Simultaneous Drilling. Fig. 70. Master-plate Jig for Very Accurate Drilling.